I first met Farrukh when I was speaking at the International Education and Resource Network (iEARN) event in Karachi. I saw him sitting there on his motorised chair smiling and listening attentively. As soon as I was done speaking, I stepped down from the podium and went straight over to him to sit down and talk. Farrukh is an inspirational human being because he has not allowed his physical disability to slow him down. Below his neck, he only has command over one hand, with the rest of his body paralysed. However, he is a photojournalist who just had his first exhibition this year. Farrukh’s family explained that he was born a healthy baby boy who was admitted to a high-end hospital in the city upon getting diarrhoea, while teething at the age of one. He suffered a respiratory arrest in this facility and as there was no oxygen ventilator available, he was driven across the city to Aga Khan Hospital and admitted into an intensive care unit there. He remained without oxygen for nine minutes, which caused him to have a brain haemorrhage. Farrukh’s condition is not an illness; it is rather a neuromuscular disorder called Dystonia. When Farrukh returned home after awakening from two weeks in a coma, they noticed that he was like a newborn again. He couldn’t hold his neck up or sit without support. However, through extensive physiotherapy and other methods, such as acupuncture and surgery, he gained enough strength back in six months to allow him to sit on his own, hold his neck up again and perform basic tasks like being able to eat on his own. Talking to Farrukh’s family made me realise that he needs independence more than the rest of us do. 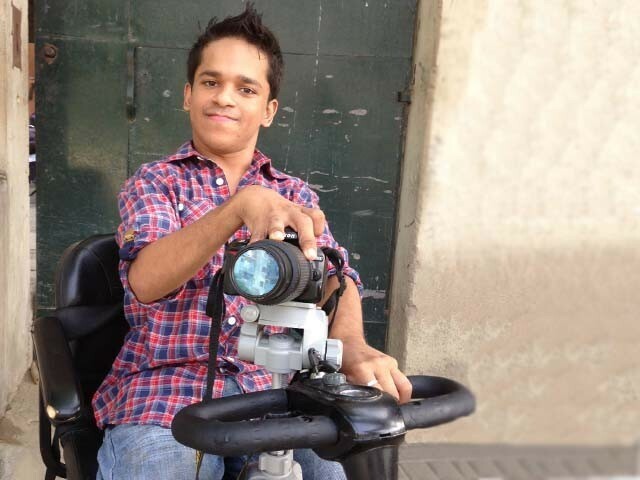 We take our well-being for granted and then there are the likes of Farrukh – hardworking and self sufficient despite his disability – achieving what he wants to achieve. Most public spaces in Pakistan don’t have special ramps for those bound to wheelchairs; still, people like Farrukh are living a normal life. Can you imagine what it would be like if we had no stairs to go up the floors in a building? What if we don’t have platforms or pathways to walk on to our intended destination? This lack of access is manifested not only in all spheres of life in Pakistan but in our minds as well. We force families with individuals like Farrukh to keep them hidden away or we stare at them with contempt or pity when we see them around us. The real truth is that individuals who are challenged aren’t scared or in need of our pity or help. They are incredibly strong, courageous and have the guts to swim against this tide of hatred we have imposed as a barrier in front of all of them in everyday life. We limit their access and we don’t give them jobs; we mutter words of pity in their presence or behind their backs. What we cannot do is take away their spirit to survive. Their invincible spirit empowers them to go out there and live life as they are meant to live it, unlike the home-bound life society expects them to live. I asked Farrukh what he wanted to say to the youth of this country. “Tell them to never give up on their dreams”, was his reply. Isn’t it ironic that those whom we have restricted access to in every way, shape or form, are telling us to dream big? Maybe it is because we have tried our level best not to let them do the same. His story certainly serves as an inspiration to many around the world. I hope he continues to follow his dreams and motivates others to do the same. I really liked the piece. Well written and inspiring. But I wish you had written more about who Farrukh is today after you told us about his past. It would have been nice to see his achievements and how he is beating the odds as a photojournalist. At this point I thought you’d move on from his background to Farrukh himself.